People of all ages attend parties, from birthday parties and Christmas gatherings to formal affairs. Holding a fundraising party offers a fantastic opportunity to raise money for your cause whilst bringing your friends, family and community together for an evening of fun. Partying is a year-round affair, but there are certain times of year when a themed party might be appropriate. You can hold Christmas parties, Spring Flings or any number of other themed events; you may even wish to base your party theme around your charitable cause. Picking a theme - or deciding not to have a theme - is the first step in planning a fundraising party. 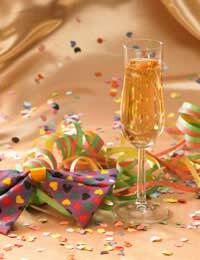 In addition to themes, you should decide early what type of party you want to hold. You'll need to consider dress code, activities, food and who you plan to invite; a children's game party requires vastly different planning than a winter formal for adults! There are numerous opportunities to raise money for your cause at a fundraising party. You can charge admission, sell drinks and food, hold raffles and auctions, and charge for games. Whilst you don't need to have all of these activities to make your party a success, you will need to decide your fundraising plan as early as possible. Expenses are an inevitable part of holding a benefit party, so it's important to decide what, if anything, you will provide for free at your party. That way, you can deduct these expenses accordingly from your fundraising profit and make more accurate projections about your potential party earnings. Once you have your fundraising party plan in place, you can begin preparing in earnest. First, you will need to find and book a suitable venue for the evening. If you're having a small party at your home, this won't be too difficult; however, you can also consider local community centres, pubs, clubs, halls and school facilities. All of these venues rent their space out for a fee. When you book your venue, remember to allow time to set up before the party and clean up afterwards. For example, if you're holding a party from 6-9 in the evening, you should book a block of time between 4-11 at a minimum to allow adequate time. You should also find out what will be provided at the venue. You may need tables, chairs and kitchen facilities - make sure these are included if you need them! Once you've booked the venue, you should have a good idea of the space you need to fill. This will impact how you decorate, how many people you invite and the amount of food and activities you provide. For larger parties, consider hiring a caterer for the evening. They will be able to set up the venue and take care of all of the cooking. Most caterers will even provide tablecloths and cutlery, although they may charge an additional fee for this. Finally, you will need to send invitations to your fundraising party. How you do this depends on the size of your gathering; you could opt to send paper invitations or call guests personally, but for a larger party you will also need to make fliers and signs advertising the event. Contact your local newspaper to see if they will cover the party or place an ad publicising the event. Because you're raising money for charity, they may be willing to run your party advertisement for a reduced rate. It's important to plan and prepare for your fundraising party as much as possible ahead of time. This helps to minimise problems that may arise and will also allow you to have more fun! If you have not hired a caterer, food should be prepared the night before the party. You should also speak with your venue to see if you can come in the morning of the party to decorate, set up tables and deliver items like drinks and games. The more you can do before the event, the better off you'll be. As the head party planner, you may feel overwhelmed by your tasks at times. Don't let these situations get the better of you. If you have friends, family or other volunteers available, delegate jobs to them. You can also ask your venue and caterers for assistance. If you get stressed in spite of this, always remember: you're doing this for your charity and it's meant to be fun. If everything at your fundraising party is worked around these two principles, things will run a lot smoother! I need to raise more money than my sister can you give me any ideas? Want to know if you sell strips of raffle tickets out of the books you buy from newsagent shops and you sell them £1.00 a strip do you then have to split the tickets up in a sense giving them 5 chances of winning the prize or do you just draw the strip which is legal.